News Americas, BROOKLYN, NY, Fri. June 6, 3014: Daniel St. Hubert , the 27-year-old, man accused of stabbing two small children in a Brooklyn housing project elevator leaving one dead and one critical, has been nabbed by police. 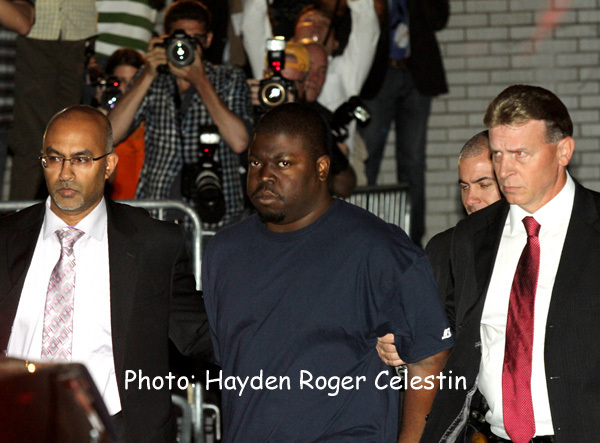 St. Hubert, center, was escorted by NYPD detectives yesterday Thursday June 5, 2014, from the 90th Precinct, in Brooklyn, New York to central booking, in downtown Brooklyn, New York. He has been charged with multiple offenses, including murder and attempted murder. He appeared stone-faced at his arraignment as Judge Raymond Rodriguez deemed him a flight risk and denied bail. The police were continuing to investigate the other stabbings. St. Hubert is accused of fatally stabbing six-year-old Prince Joshua (P.J.) Avitto and the near-fatal stabbing of 7-year-old Mikayla Capers. He is also suspected of stabbing a homeless man in Chelsea just hours after his release from a five-year term in prison for trying to strangle his mother with an electrical cord. NYPD police detectives believe St. Hubert may have also fatally stabbed an 18-year-old woman on a Brooklyn street last week.